If your organization recently had an extremely successful fundraising event or service project, just welcomed a new director, or is making strides in your mission, a press release is the perfect way to announce it! A press release is a short, compelling story written by a PR professional and sent to the media. In the past, a press release would have been sent to newspapers but in the digital age, it can be sent to any number of media contacts: reporters, journalists, bloggers, influencers, etc. A press release gives very specific, brief information about an organization, event, or initiative. It should always be newsworthy. It should never be full of boilerplate information that anyone can find online. There are many more reasons a nonprofit may write a press release and choosing the right events to write press releases for goes a long way in getting the media to pay attention to your organization. Writing a press release can be intimidating. After all, there is a certain format they follow (which is explained below) and it can seem tricky to write one in a way that gets media attention. It’s not as complicated as it seems, though. We’ve broken down the process into 6 steps so you can write a press release that gets your organization noticed. This advice applies to almost anything you write but it’s especially important with press releases. Your headline and your first few sentences should hook your reader and give them the most essential part of your press release. If someone were to only read the headline and first paragraph, you want them to know what the rest of the release is about. When writing your headline and first paragraph, humanize your topic and make them care about what you have to say. For example, the headline, “ABC Organization Organizes State-Wide Service Project” is vague. It would be easy for someone to stop reading after the headline. But changing it to something like, “ABC Organization Organizes State-Wide Service Project to Clean NC’s Rivers” gives a lot more information with just a few extra words. Adding a subheadline like, “North Carolinians Collect 1 Ton of Trash From Riverbanks” makes it even more powerful. The goal in writing a press release is to tell a story that is compelling, informative, and to-the-point. Use the inverted pyramid technique to help keep you on track. This technique puts the most important information at the start of the press release, with less essential information at the bottom. If you include boilerplate information about your organization (mission statement, elevator pitch, etc), do so at the very bottom of the release. You should never start your press release with this information. Along with the inverted pyramid technique, keep your story concise by answering the five Ws and one H: who, what, when, where, why, and how. Answering these questions ensures you have all the essential information while keeping your release succinct. When you are writing your press release and answering these questions, be sure you’re writing for a general audience. Don’t assume everyone who reads your release will have the same knowledge of your industry and the issues you work to solve. Avoid using jargon, acronyms, and language that those outside of your industry may not understand. It’s important that your press release is easy to share and that people want to share it. Be sure to include photos and/or videos, if you have them, and hyperlinks to relevant pages on your website. Include your social media handles in your contact information so readers can easily find and follow your organization. It’s also extremely important that your press release is mobile friendly. Many journalists don’t sit at a computer all day and frequently check their email on their phone or tablet. If your press release doesn’t load on a mobile device or is hard to read on one, they’re not likely to come back to it on a computer and you’ve lost a valuable opportunity. To get others to share your press release, start by sharing it yourself! Post the link to your organization’s social media profiles with a compelling caption and encourage sharing. If you use Twitter, pin the tweet to the top of your feed so it’s the first thing others see when they visit your Twitter profile. You can also pin posts to the top of your Facebook page, which will make sure visitors see it. Ideally, this is something you will do before you’ve written the press release. Building relationships with journalists and media that align with your organization’s cause can make all the difference in getting traction for your press release. Journalists and writers get dozens of cold emails a week and the chances of them responding to or running with your story if it’s in a cold email is relatively low. But if you have a relationship with them, they’re much more likely to give your press release a second look. 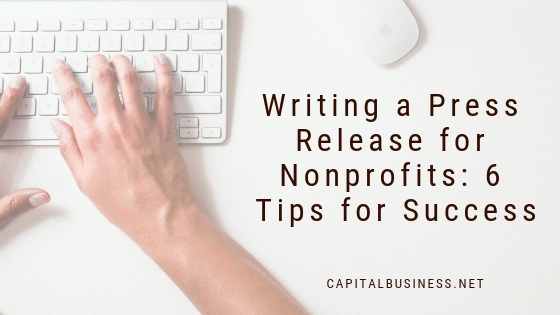 When you master these six steps, you’ll be that much closer to writing a press release that garners attention and support for your nonprofit! Example:Basic information about your nonprofit such as your goals, initiatives, mission statement, etc. Center hash marks/pound signs just below the body of the release to signal the end of the release. Do you have experience writing press releases for your nonprofit organization? Do you have tips to share? Let us know on Twitter or Facebook!